After the previous weekend's skunking despite having micros milling around my boots, there was no way I was going to leave the micro fishing gear home this past weekend! Sunday was a much more productive day. 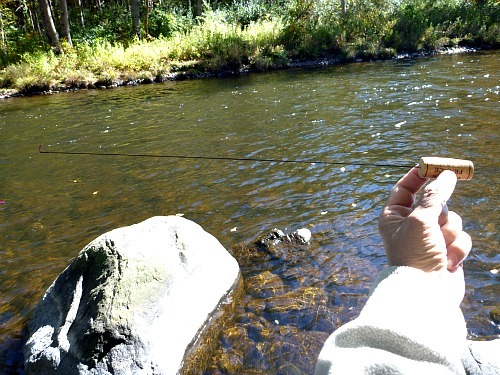 I went back to the Farmington River in CT, and although it wasn't a "many" day, it was a memorable day. As seems to be the case more often than not lately, when I got to the river, there was a guy right in the spot I wanted to start. That particular stretch of the river is just small enough that I felt if I went in also I would be crowding him. I went to my second spot, and sure enough there was a guy there, too. That spot was large enough I could slide in below him and still give him enough space. While waiting for him to move on upstream, I caught a small brookie. He eventually moved up to the next pool and I was able to fish the spot I wanted to fish. 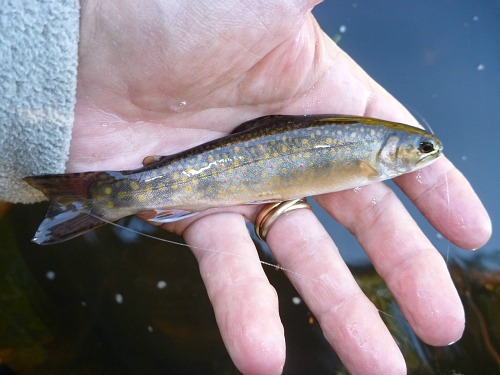 I caught a couple more small brookies and a salmon parr, but there was no sign of the nice brown that Adam K had hooked (and broken off) the last time we were there. After thoroughly fishing the head of the pool it was lunch time, so I had a sandwich while driving downstream to the spot where I wanted to start initially. By the time I got there the other angler had left but it seemed he took all the fish with him. The day was not shaping up to be at all like the last few times I had been to the Farmington. After a while - a fishless while - I saw a several micros around my boots. They were neither as many nor as close as the previous week up on the Willowemoc, but they still offered a chance to put theory into practice. I rigged a Gamakatsu Smallest tanago hook, a single size 10 shot and tiny speck of worm, and using a rod tip stuck in a wine bottle cork as a micro rod, gave it a go. The micros repeatedly hit the bit of worm, but the hook was too big! Maybe a week or so ago I heard a podcast in which one of the presenters said he hated tanago hooks because it was hard to keep fish on the hook. Well, it may be hard because the hook points are short. 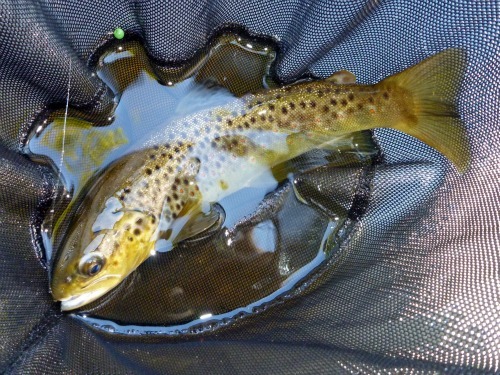 The points are short so that small fish, really small fish, can get them in their mouths! The Gamakatsu Smallest has a significantly longer point - long enough that I've caught sunfish and trout with them and had no problem keeping them on the hook. For the smallest micros, though, you really do need a hook with a short point. I would have been much better off with a Gamakatsu Ultimate rather than a Gamakatsu Smallest (which ironically, isn't even close to the smallest hook). As it is, one of the more aggressive fish finally got the hook point in its mouth and I was able to set the hook. 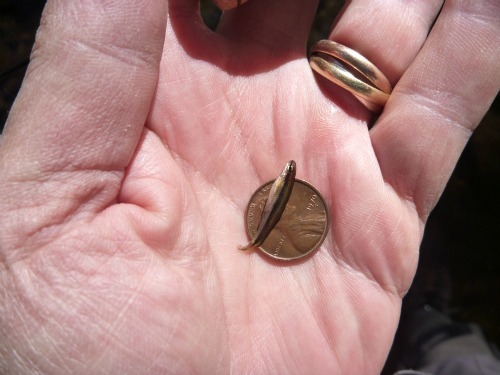 For people who know how small tanago hooks are, the photo above pretty clearly shows how small the fish was. For people who are not familiar with tanago hooks, look at the photo below. 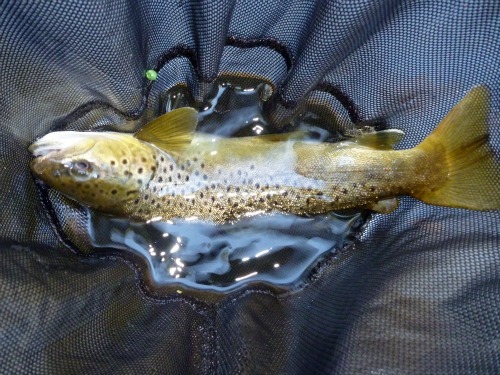 I did catch a few more trout, but after a personal best (personal least?) fish, a couple 10" stockies were a bit of an anticlimax. The day was indeed memorable. 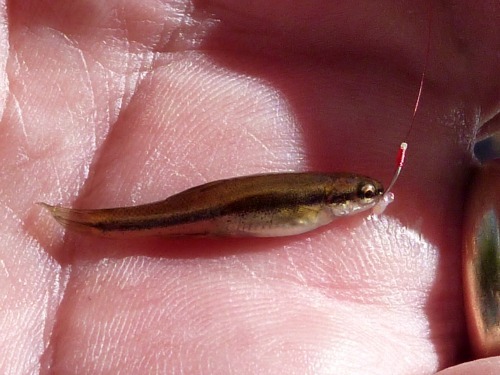 Not for the brown trout, or the brookies, or even the aerobatic salmon parr, but for a blacknose dace. To most fishermen, a Blacknose Dace is a fly - a bucktail developed by Art Flick - something they'd happily fish with but wouldn't even think of fishing for. For me a blacknose dace is a catch I will never forget.